This article is about the Hawaiian island. For the figure in Polynesian mythology, see Māui (mythology). For other uses, see Maui (disambiguation). The island of Maui ( /ˈmaʊ.i/; Hawaiian: [ˈmɐwwi])  is the second-largest of the Hawaiian Islands at 727.2 square miles (1,883 km2) and is the 17th largest island in the United States. Maui is part of the State of Hawaii and is the largest of Maui County's four islands, which include Molokaʻi, Lānaʻi, and unpopulated Kahoʻolawe. In 2010, Maui had a population of 144,444, third-highest of the Hawaiian Islands, behind that of Oʻahu and Hawaiʻi Island. Kahului is the largest census-designated place (CDP) on the island with a population of 26,337 as of 2010 [update]  and is the commercial and financial hub of the island[ citation needed]. Wailuku is the seat of Maui County and is the third-largest CDP as of 2010 [update]. Other significant places include Kīhei (including Wailea and Makena in the Kihei Town CDP, the island's second-most-populated CDP), Lahaina (including Kāʻanapali and Kapalua in the Lahaina Town CDP), Makawao, Pukalani, Pāʻia, Kula, Haʻikū, and Hāna. Native Hawaiian tradition gives the origin of the island's name in the legend of Hawaiʻiloa, the navigator credited with discovery of the Hawaiian Islands. According to it, Hawaiʻiloa named the island after his son, who in turn was named for the demigod Māui. The earlier name of Maui was ʻIhikapalaumaewa. The Island of Maui is also called the "Valley Isle" for the large isthmus separating its northwestern and southeastern volcanic masses. The older, western volcano has been eroded considerably and is cut by numerous drainages, forming the peaks of the West Maui Mountains (in Hawaiian, Mauna Kahalawai). 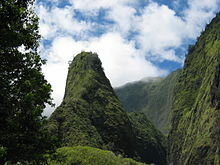 Puʻu Kukui is the highest of the peaks at 5,788 feet (1,764 m). The larger, younger volcano to the east, Haleakalā, rises to more than 10,000 feet (3,000 m) above sea level, and measures 5 miles (8.0 km) from seafloor to summit. The eastern flanks of both volcanoes are cut by deeply incised valleys and steep-sided ravines that run downslope to the rocky, windswept shoreline. The valley-like Isthmus of Maui that separates the two volcanic masses was formed by sandy erosional deposits. Maui is part of a much larger unit, Maui Nui, that includes the islands of Lānaʻi, Kahoʻolawe, Molokaʻi, and the now submerged Penguin Bank. During periods of reduced sea level, including as recently as 20,000 years ago, they are joined together as a single island due to the shallowness of the channels between them. 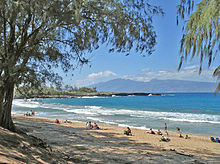 Half of Maui is situated within 5 miles (8.0 km) of the island's coastline. This, and the extreme insularity of the Hawaiian Islands account for the strong marine influence on Maui's climate. Gross weather patterns are typically determined by elevation and orientation towards the Trade winds (prevailing air flow comes from the northeast). Maui's rugged, irregular topography produces marked variations in conditions. Air swept inland on the Trade winds is shunted one way or another by the mountains, valleys, and vast open slopes. This complex three-dimensional flow of air results in striking variations in wind speed, cloud formation, and rainfall. Maui displays a unique and diverse set of climatic conditions, each of which is specific to a loosely defined sub-region of the island. These sub-regions are defined by major physiographic features (such as mountains and valleys) and by location on the windward or leeward side of the island. Windward lowlands – Below 2,000 feet (610 m) on north-to-northeast sides of an island. Roughly perpendicular to direction of prevailing trade winds. Moderately rainy; frequent trade wind-induced showers. Skies are often cloudy to partly cloudy. Air temperatures are more uniform (and mild) than those of other regions. Leeward lowlands – Daytime temperatures are a little higher and nighttime temperatures are lower than in windward locations. Dry weather is prevalent, with the exception of sporadic showers that drift over the mountains to windward and during short-duration storms. Interior lowlands – Intermediate conditions, often sharing characteristics of other lowland sub-regions. Occasionally experience intense local afternoon showers from well-developed clouds that formed due to local daytime heating. Leeward side high-altitude mountain slopes with high rainfall – Extensive cloud cover and rainfall all year long. Mild temperatures are prevalent, but humidity is higher than any other sub-region. Leeward side lower mountain slopes – Rainfall is higher than on the adjacent leeward lowlands, but much less than at similar altitudes on the windward side; however, maximum rainfall usually occurs leeward of the crests of lower mountains. Temperatures are higher than on the rainy slopes of the windward sides of mountains; cloud cover is almost as extensive. High mountains – Above about 5,000 feet (1,500 m) on Haleakalā, rainfall decreases rapidly with elevation. Relative humidity may be ten percent or less. The lowest temperatures in the state are experienced in this region: air temperatures below freezing are common. Showers are very common; while some of these are very heavy, the vast majority are light and brief. Even the heaviest rain showers are seldom accompanied by thunder and lightning. Throughout the lowlands in summer an overwhelming dominance of trade winds produces a drier season. At one extreme, the annual rainfall averages 17 inches (430 mm) to 20 inches (510 mm) or less in leeward coastal areas, such as the shoreline from Maalaea Bay to Kaupo, and near the summit of Haleakalā. At the other extreme, the annual average rainfall exceeds 300 inches (7,600 mm) along the lower windward slopes of Haleakalā, particularly along the Hāna Highway. Big Bog, a spot on the edge of Haleakala National Park overlooking Hana at about 5,400 feet elevation had an estimated mean annual rainfall of 404.4 inches over the 30-year period of 1978 to 2007. If the islands of the State of Hawaii did not exist, the average annual rainfall on the same patch of water would be about 25 inches (640 mm). Instead, the mountainous topography of Maui and the other islands induce an actual average of about 70 inches (1,800 mm). In the lowlands rainfall is most likely to occur throughout the year during the night or morning hours, and least likely in mid-afternoon. The most pronounced daily variations in rainfall occur during the summer because most summer rainfall consists of trade winds showers that most often occur at night. Winter rainfall in the lowlands is the result of storm activity, which is as likely to occur in the daytime as at night. Rainfall variability is far greater during the winter, when occasional storms contribute appreciably to rainfall totals. With such wide swings in rainfall, it is inevitable that there are occasional droughts, sometimes causing economic losses. These occur when winter rains fail to produce sufficient significant rainstorms, impacting normally dry areas outside the trade winds that depend on them the most. The winter of 2011-2012 produced extreme drought on the leeward sides of Moloka'i, Maui, and Island of Hawaii. The blend of warm tropical sunshine, varying humidity, ocean breezes and trade winds, and varying elevations create a variety of microclimates. Although the Island of Maui is small, it can feel quite different in each district resulting in a unique selection of micro-climates that are typical to each of its distinctive locations: Central Maui; leeward South Maui and West Maui; windward North Shore and East Maui; and Upcountry Maui. Although Maui’s daytime temperatures average between 75 and 90 degrees year round, evening temperatures are about 15 degrees cooler in the more humid windward areas, about 18 degrees cooler in the dryer leeward areas, and cooler yet in higher elevations. Central Maui consists primarily of Kahului and Wailuku. 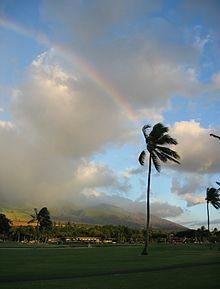 Kahului is literally the center of the island, and tends to keep steady, high temperatures throughout the year. The micro-climate in Kahului can be at times muggy, but it usually feels relatively dry and is often very breezy. The Wailuku area is set closer to the West Maui Mountain range. Here, more rainfall will be found throughout the year, and higher humidity levels. Windward side includes the North Shore (Paia and Haiku) and East Maui (Keanae, Hana and Kipahulu). Located in the prevailing, northeast trade winds, these areas have heavier rainfall levels, which increase considerably at higher elevations. Upcountry Maui (Makawao, Pukalani, and Kula) at the 1,700- to 4,500-foot levels, provides mild heat (70s and low 80s) during the day and cool evenings. The higher the elevation, the cooler the evenings. During Maui's winter, Upper Kula can be as cold as 40 degrees in the early morning hours, and the Haleakala summit can dip below freezing. An exception to the normal pattern is the occasional winter “Kona storms” which bring rainfall to the South and West areas accompanied by high southwesterly winds (opposite of the prevailing trade wind direction). The birdlife of Maui does not have as high a concentration of endemic birdlife as some other Hawaiian islands, as recently as 200,000 years ago it was linked to the neighboring islands of Molokai, Lanai and Kaho'olawe in a large island called Maui Nui, thus reducing the chance of species endemic to any single one of these. Although Molokai does have several endemic species of birds, some extinct and some not, in modern times Maui, Lanai and Kaho'olawe have not had a whole lot of endemic birdlife. In ancient times during and after the period in which Maui was part of Maui Nui, Maui boasted a species of moa-nalo (which was also found on Molokai, Lanai and Kaho'olawe), a species of harrier (the Wood harrier, shared with Molokai), an undescribed sea eagle (Maui only), and three species of ground-dwelling flightless ibis ( Apteribis sp. ), plus a host of other species. Today, the most notable non-extinct endemics of Maui are probably the 'Akohekohe (Palmeria dolei) and the Maui parrotbill (Pseudonestor xanthophrys), both of which are critically endangered and only found in alpine forest on the windward slopes of Haleakala. Birds found on other islands as well as Maui include the I'iwi (Drepanis coccinea], 'Apapane (Himatione sanguinea), as well as the Nene (Branta sandvicensis, the state bird of Hawaii), Hawaiian coot (Fulica alai), and a number of others. Polynesians from Tahiti were the original people to populate Maui. The Tahitians introduced the kapu system, a strict social order that affected all aspects of life and became the core of Hawaiʻian culture. Modern Hawaiʻian history began in the mid-18th century. Kamehameha I, king of the island of Hawaiʻi, invaded Maui in 1790 and fought the inconclusive Battle of Kepaniwai, but returned to Hawaiʻi to battle a rival, finally subduing Maui a few years later. On November 26, 1778, explorer James Cook became the first European to see Maui. Cook never set foot on the island because he was unable to find a suitable landing. The first European to visit Maui was the French admiral Jean-François de Galaup, comte de Lapérouse, who landed on the shores of what is now known as La Perouse Bay on May 29, 1786. More Europeans followed: traders, whalers, loggers (e.g., of sandalwood) and missionaries. The latter began to arrive from New England in 1823, settling in Lahaina, which at that time was the capital. They clothed the natives, banned them from dancing hula, and greatly altered the culture. The missionaries taught reading and writing, created the 12-letter Hawaiian alphabet, started a printing press in Lahaina, and began writing the islands' history, which until then was transmitted orally. Ironically, the missionaries both altered and preserved the native culture. The religious work altered the culture while the literacy efforts preserved native history and language. Missionaries started the first school in Lahaina, which still exists today: Lahainaluna Mission School, which opened in 1831. Japanese laborers on Maui harvesting sugarcane in 1885. At the height of the whaling era (1843–1860), Lahaina was a major center. In one season over 400 ships visited with up to 100 anchored at one time in Lāhainā Roads. Ships tended to stay for weeks rather than days, fostering extended drinking and the rise of prostitution, against which the missionaries vainly battled. Whaling declined steeply at the end of the 19th century as petroleum replaced whale oil. Kamehameha's descendants reigned until 1872. They were followed by rulers from another ancient family of chiefs, including Queen Liliʻuokalani, deposed in the 1893 overthrow of the Kingdom of Hawaii by American business interests. One year later, the Republic of Hawaii was founded. The island was annexed by the United States in 1898 and made a territory in 1900. Hawaiʻi became the 50th U.S. state in 1959. In 1937, Vibora Luviminda trade union conducted the last strike action of an ethnic nature in the Hawaiʻian Islands against four Maui sugarcane plantations, demanding higher wages and the dismissal of five foremen. Manuel Fagel and nine other strike leaders were arrested, and charged with kidnapping a worker. Fagel spent four months in jail while the strike continued. Eventually, Vibora Luviminda made its point and the workers won a 15% increase in wages after 85 days on strike, but there was no written contract signed. Maui was centrally involved in the Pacific Theater of World War II as a staging center, training base, and rest and relaxation site. At the peak in 1943-44, more than 100,000 soldiers were there. The main base of the 4th Marine Division was in Haiku. Beaches were used to practice landings and train in marine demolition and sabotage. The island experienced rapid population growth through 2007, with Kīhei one of the most rapidly growing towns in the United States (see chart, below). The island attracted many retirees, adding service providers for them to the rapidly increasing number of tourists. Population growth produced strains, including traffic congestion, housing unaffordability, and issues of access to water. Most recent years have brought droughts, resulting in the ʻĪao aquifer being drawn at possibly unsustainable rates above 18 million U.S. gallons (68,000 m3) per day. Recent estimates indicate that the total potential supply of potable water on Maui is around 476 million U.S. gallons (1,800,000 m3) per day,[ citation needed] virtually all of which runs off into the ocean. In 1974, Emil Tedeschi of the Napa Valley winegrower family of Calistoga, California, established the first Hawaiian commercial winery, the Tedeschi Winery at Ulupalakua Ranch. The major industry on Maui is tourism. Other large sectors include retail, health care, business services and government. Maui also has a significant presence in agriculture and information technology. 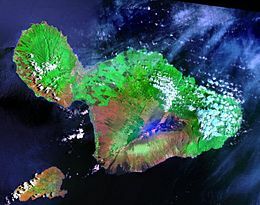 The Maui High Performance Computing Center (MHPCC) at the Air Force Maui Optical and Supercomputing observatory  in Kīhei is a United States Air Force research laboratory center that is managed by the University of Hawaii. It provides more than 10 million hours of computing time per year to the research, science and military communities. Snorkeling is one of the most popular activities on Maui. There are over 30 beaches and bays to snorkel at around the island. The Hawaiian Island of Maui has been voted "Best Island in the World" because of the nice weather environment and due to the fact that Maui has many swimmable beaches. Hawaiian Islands are known for having year round trade winds . Maui's trade winds tend to come in from the northeast, making the most popular places to snorkel on the south and west shores of Maui. Having many mountains on Maui, helps with the trade winds not being able to reach the beaches located on the south and west of the island, making the ocean water very clear and peaceful. Maui is a well known destination for windsurfing. Kanaha Beach Park is a very well-known windsurfing spot and may have stand-up paddle boarders or surfers if there are waves and no wind. Windsurfing has evolved on Maui since the early 1980s when it was recognized as an ideal location to test equipment and publicize the sport. One of the most popular sports in Hawaii. Ho'okipa Beach Park is one of Maui's most famous surfing and windsurfing spots. Other famous or frequently surfed areas include Slaughterhouse Beach, Honolua Bay, Pe'ahi (Jaws), and Fleming Beach. The north side of Maui absorbs the most swell during the winter season and the south and west in the summer time. Due to island blocking, summer south swells tend to be weak and rare. One of the newest sports on Maui is Kiteboarding/Surfing. Kanaha Beach Park is where beginner, intermediate and advanced Kiters gather. It is known as Kite Beach. Kiters share the water with Windsurfers who have dominated the area since the early 1980s. Since 2008 there has been an explosion in the number of Kiters mostly due to advances in equipment and safety. The big tourist spots in Maui include the Hāna Highway, Haleakalā National Park, Iao Valley, and Lahaina. The Hāna Highway runs along the east coast of Maui, curving around mountains and passing by black sand beaches and waterfalls. Haleakalā National Park is home to Haleakalā, a dormant volcano. Snorkeling can be done at almost any beach along the Maui coast. Surfing and windsurfing are also popular on Maui. 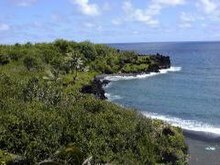 Maui County welcomed 2,207,826 tourists in 2004 rising to 2,639,929 in 2007 with total tourist expenditures north of US$3.5 billion for the Island of Maui alone. While the island of Oʻahu is most popular with Japanese tourists, the Island of Maui appeals to visitors mostly from the U.S. mainland and Canada: in 2005, there were 2,003,492 domestic arrivals on the island, compared to 260,184 international arrivals. For airports on Lanai and Molokai, see Maui County § Airports. ^ "Hawaii January 29, 2014". Retrieved 10 October 2014. ^ Kinney, Ruby Kawena (1956). "A Non-purist View of Morphomorphemic Variations in Hawaiian Speech". Journal of the Polynesian Society. 65 (3): 282–286. ^ Sterling, Elspeth P. (1 June 1998). Sites of Maui. Bishop Museum Press. p. 2. ISBN 978-0-930897-97-0. ^ "Hawaiian Volcano Observatory". volcanoes.usgs.gov. ^ "Makaluapuna Point". Archived from the original on 2007-10-14. ^ Observatory, HVO, Hawaiian Volcano. "East Maui volcano (Haleakala), Hawai`i". hvo.wr.usgs.gov. Retrieved 2016-11-15. ^ "'Big Bog' ranks among wettest spots in Hawaii, possibly world - Mauinews.com - The Maui News". www.mauinews.com. Retrieved 2016-01-25. ^ "Population Estimates". iwc.int. Retrieved 19 November 2017. ^ "Record Number of Whales Sighted During Great Whale Count". pacificwhale.org. ^ "History of Sandalwood on Maui". tourmaui.com. ^ Goldman, Rita (May 2008). "Hale Pa'i". Archived from the original on 31 May 2010. Retrieved 8 December 2010. ^ "Pending ruling restores water to 4 streams on Maui". Honolulu Star-Advertiser - Hawaii Newspaper. Retrieved 10 October 2014. ^ "Earth foundation-corey-ryder". Archived from the original on 24 October 2014. Retrieved 10 October 2014. ^ "Supreme Court ruling forces Hawaii Superferry shutdown, layoffs". ^ "How Activists Are Restricting Use of a Major Pesticide". Time. Archived from the original on 2018-01-29. Retrieved 2018-08-15. ^ "Unemployment rate". Yahoo. 4 December 2010. ^ "VIDEO: Maui Unemployment Rate Lowest Since 2008 - Maui Now". mauinow.com. ^ "Maui Now: Maui Unemployment Rate Remains Low in January". Maui Now | Maui Unemployment Rate Remains Low in January. Retrieved 2018-03-14. ^ US Department of Agriculture (2013). "20121 Census of Agriculture - Maui County" (PDF). ^ "Maui Land & Pineapple Company homepage". Retrieved 8 December 2010. ^ "Commercial and Sugar Company". Retrieved 8 December 2010. ^ "Bittersweet End to Cane Plantation Days". hpr2.org. Retrieved 2016-01-07. ^ "Maui Pine assets sold for quarter of worth - Pacific Business News". Pacific Business News. Retrieved 2016-01-15. ^ "Election results show money doesn't guarantee votes". November 5, 2014. Archived from the original on 2014-12-16. Retrieved 16 November 2014. ^ AUDREY McAVOY; and KHON2 (November 14, 2014). "Federal judge blocks Maui GMO moratorium". Archived from the original on 2014-12-22. Retrieved 16 November 2014. ^ "Maui High Performance Computing Center homepage". Archived from the original on 21 September 2010. Retrieved 8 December 2010. ^ "Maui Research & Technology Center". Archived from the original on March 4, 2009. Retrieved September 4, 2012. ^ "What is the Maui Research & Technology Center?". Archived from the original on September 29, 2007. Retrieved September 4, 2012. ^ "TTDC homepage". Retrieved 8 December 2010. ^ "Hawaii's Emerging Technology Industry" (PDF). January 2000. ^ "Institute for Astronomy, Maui homepage". Retrieved 8 December 2010. ^ "Maui Space Surveillance Site". Archived from the original on September 29, 2007. Retrieved September 4, 2012. ^ "Maui Snorkeling Secrets! The Complete Guide to Snorkeling in Maui!". 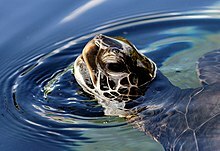 www.hawaiisnorkelingguide.com. Retrieved 2018-04-30. ^ "Lahaina Town History Timeline | Maui, Hawaii Events". lahainatown.com. Archived from the original on 2018-01-26. Retrieved 2018-01-25. ^ "Best Island In The World" (PDF) (Press release). Maui Visitors Bureau. Archived from the original (PDF) on 2009-12-22. ^ "Save Makena". Save Makena. ^ Tayfun King Fast Track (2009-03-09). "Concerns Of Overdevelopment In Maui". BBC World News. ^ "Bus Service Information". County of Maui. Retrieved 8 December 2010. ^ "Maui Memorial Medical Center". Retrieved 10 October 2014. ^ "Kula Hospital". Retrieved 10 October 2014. ^ "Hana Health Clinic". Retrieved 10 October 2014. Kyselka, Will; Lanterman, Ray E. (1980). Maui, How It Came to Be. University of Hawaii Press. ISBN 978-0-8248-0530-2. "Basic Maui Map: Can I drive around the entire island? ".